Three resident bottlenose dolphins (Tursiops truncatus) continue to thrill onlookers with their acrobatic antics in the Killiney Bay / Dalkey area of Dublin Bay. Footage of the trio even featured on last night’s RTÉ news. According to the Irish Whale and Dolphin Group (IWDG) there have been daily sightings of the dolphins over the last week or so. 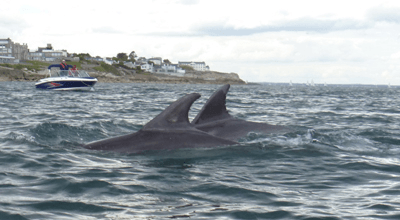 Since August 2010 the group has validated more than 120 sightings of this particular group of dolphins between Wicklow Harbour and Dunlaoghaire, with many of the sightings coming from the Killiney Bay area, suggesting that this is an important habitat for the animals. Reports have even come in from the DART between Killiney and Dalkey. “There aren’t too many European capitals which can boast whale watching opportunities from public transport systems!” comments Padraig Whooley, IWDG sightings coordinator, on the organisation’s website. While the IWDG is encouraging people to get out and see the dolphins, they suggest watching them from the shore, and are cautioning boat owners to keep their distance and allow the dolphins to control the extent of the interaction. If you plan on taking out a boat to see them, we’d ask you to familiarise yourself with Marine Safety Notice 15, which covers Whale-Watching regulations. It is law, and not a voluntary code. As always, we’d encourage people to enjoy the spectacle from the shore, which may even offer the best overall views of them. Suggested sites would be Vico Road and White Beach area. But if you are on the water with them, and you feel it’s becoming a bit of a circus, let your concerns be known to other boat users and leave the area. This is a great opportunity to get out and see some of our marine mammals near our capital city. If you get to see them, let us know in the comments, and please share your photographs, video or comments on the Ireland’s Wildlife page on Facebook. We just saw two dolphins off the shore in Killiney/Dalkey. First sighting was beside the first marker off the beach and then the second sighting was moving towards Sorrento Terrace. Didn’t manage to get a photo tho ! I was walking along the beach in the Bray to Killiney area today form about 1.30pm – 3.30pm and there was a speed boat following the dolphins at high speed all the way, it stopped really close by them when it caught up with them, then as soon as they started moving again they followed them at high speed again…can this be distressing to the Dolphins? Short answer… yes… it could be distressing to the dolphins. Dolphins will often “bow ride” a boat travelling at speed — but in those instances the dolphins approach the boat, not the other way around. Your description sounds like the boat was actively chasing the dolphins at close quarters… which is very irresponsible to put it mildly. I’m not sure what the legal position is on this — but if you contact your local National Parks and Wildlife service ranger they should be able to help. Go to http://npws.ie/contactus/ and click on the Regional Management Contact Information link to open a PDF of local contacts. Hi, we saw two today. It was an amazing sight. I thought there were meant to be three. I wonder where the third one is.